With the advent of the heavy use of technology devices throughout the general public, people experiencing Carpal Tunnel Syndrome or CTS, seems to be on the rise. Although CTS is still primarily seen in individuals who rely heavily on their hands in order to perform work duties, as in the case of manufacturing jobs, professional cleaning, sewing or packing jobs, for the average person the plethora of opportunities to overuse their hands is increasing as well. More and more, people are using computer keyboards both at work and daily at home, along with texting on their phones and/or playing video games. Fortunately, there are many solutions for this uncomfortable and painful medical issue. At the base of each hand, there is a narrow passageway called the “carpal tunnel”. This tunnel houses the tendons that move the fingers, along with the median nerve which extends from the forearm to the palm of the hand. 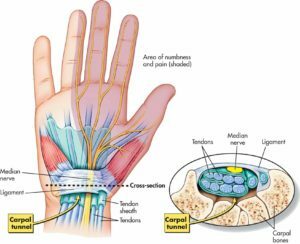 When an individual overuses one or both of their hands, the tendons inside the carpal tunnel area can become irritated and swollen. This swelling can compress the median nerve, resulting in numbness and pain in the affected wrist and hand, and in some cases the forearm and arm. Left unchecked, CTS can eventually cause hand weakness, so it is important to receive timely medical treatment for this issue. Along with the pain and numbness during intensive hand/wrist activities, many CTS-affected individuals report chronic issues with numbness, burning and tingling of their hands and fingers while they are sleeping. During sleep, most individuals either bend one or both of their wrists at various times, causing further irritation to tissues in the carpal tunnel area. According to the National Institute of Neurological Disorders and Stroke, women are three times more likely to be affected by CTS. It is theorized this occurs because women generally have smaller wrists than males. Carpal tunnel issues generally occur first in an individual’s dominant hand, although it can affect both hands, at the same time or at different times during an individual’s life. The institute also reports that people with metabolic disorders such as diabetes will typically have increased susceptibility to carpal tunnel issues, since these types of disorders often directly affect nerve function. People who extensively use their hands, whether from work-related activities, hobbies or other recreational activities, are also at greater risk for developing carpal tunnel issues. 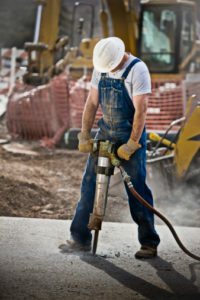 Construction worker with jack hammer. If you suspect you have Carpal Tunnel Syndrome, you should get an official diagnosis from a physician. There are other medical issues including a pinched nerve in the cervical (neck) region and a pinched nerve in the elbow region (tennis elbow) that can mimic CTS, so it is important not to self-diagnosis and attempt to treat hand/wrist pain and numbness on your own. While you are waiting to see your physician, there are some at-home tests you can perform that potentially can help determine whether CTS is an issue or not. The first test is called, “Tinel’s Sign”. To conduct this test, place the affected hand on a flat surface, with the palm facing up. With the opposite hand, tap the middle area on the affected wrist, right at the crease of the wrist or slightly below. If you experience any numbness or tingling from the tapping, you might have CTS. The next test is called, “Phalen’s Test“. This test requires an individual to place their hands in front of them, elbows out to the side, with fingers pointing down to the floor, while pressing the backs of the hands together. Hold the position for 60 seconds. If the test increases numbness, burning, tingling and/or hand pain, this could be an indication of CTS. Lastly, is the “Reverse Phalen’s Test”. 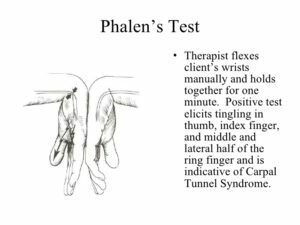 This requires a patient to maintain the position of the arms and elbows as in the Phalen’s Test, except the hands are placed palm-side together, with fingers pointing up, much like a praying position. Hold the position for 60 seconds and then evaluate for any increased signs of pain, numbness or tingling. Not all cases of CTS will result in surgery and the sooner an individual begins treating their CTS, the less likely their case will require surgical intervention. There are many treatments available that can resolve CTS including rest, ice, wearing wrist splints during sleep, and a series of physical therapy appointments where patients can learn how to stretch and strengthen muscles in and around their forearms, hands and wrists. Physical therapists can also make recommendations on how to improve work areas, including the proper positioning of hands and wrists in order to reduce strain. If you would like more information about physical therapy treatment for CTS, please call 570-208-2787 or email cawleyptfrank@gmail.com. You can also visit our website at: http://cawleypt.net.